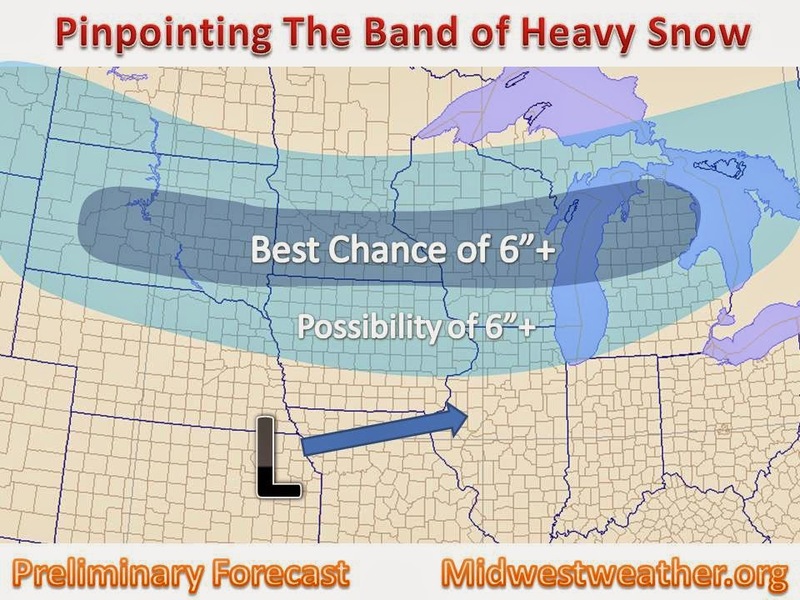 Midwest Winter Weather Blog: Where Will this Heavy Band of Snow Set Up? The track of the system, always the million dollar question when it comes to winter storms and snowfall associated with them. The track and position of baroclinicity will be the major wild card in the system on Monday. A couple days ago most of the major computer models had the band of heavy snow setting up along an axis near the WI/IL border extending eastward. In the last few runs the common trend is to shift north with each run. However, the GEM and some WRF model runs still have central Iowa and southern Wisconsin in the bulls eye. - The track, while we have a general consensus, we will know more tomorrow! - Banding of heavier snow, will an area of deformation set up, or will we see a broad area of 4-7" instead of a narrow area of 7-10"